This item comes from a short story that is a Cold War classic, and well worth reading. Out of warrens in the wall, tiny robot mice darted. 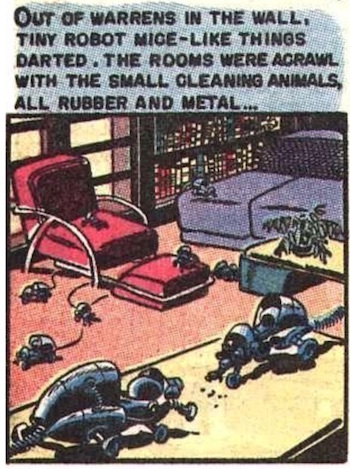 The rooms were acrawl with the small cleaning animals, all rubber and metal. 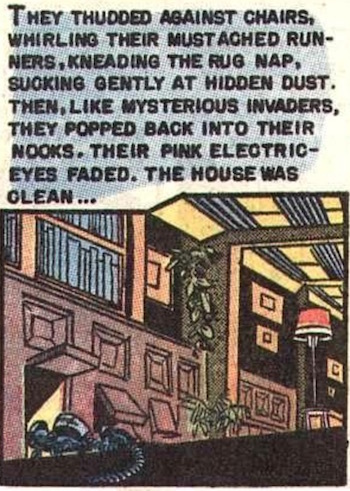 They thudded against chairs, whirling their mustached runners, kneading the rug nap, sucking gently at hidden dust. Then, like mysterious invaders, they popped into their burrows. Their pink electric eyes faded. The house was clean. And for larger items, the 'copper scrap rats' would come and seize the offending matter with their miniature jaws. Although the iRobot Roomba is perhaps more famous, the world's first automatic vacuum cleaner is the Electrolux Trilobite, presented to the public on the BBC in 1997. Robot mouse fans might also be interested in the Greg Bear's dustmice, tiny robotic detectives from his 1990 novel Queen of Angels. As far as I know, the first example of this kind of technovelgy are the golden shuttles from a 1941 story by Eric Frank Russell (writing under a pseudonym).